How Is This Door Made? This is a door in Demark that was built in the 1930's so the story goes. Does anyone want to venture a guess as to how it was built? I do not know, but have a few guesses. I do have an inquiry for something similar. Looks joined with panel, rails etc then hand carved to me. a client had one done on the beach in Costa Rica a few years ago and sent to SC, Damn thing checked and split like crazy !,, glue it up right and find a hand carver or a good CNC guy ! It would be nice to see the inside to see if it was done the same. If it is, I think I would do two layers, with a T slot milled into the back of each, then use a matching I beam to slide into those slots from the hinge side. This would allow expansion / contraction, while keeping them flat since there isn't anything showing across the top. At first glance I thought there was a bottom rail, but after looking closer, I think that is just carved texture for the limb perch. While I really like the way the Owl totally fills the space, I think the breast feather detail is kinda weak and could be improved. A Barred Owl has some vertical stripes, and Great Horned has horizontal that while actually color change instead of actual feather detail, might work better. Looks like it should be a fun project, I wish it had come my way. Internet research indicates the door was made in the 1930's and is in Denmark. No other pictures or info on construction. I also think the wood face is all vertical grain. I have blown it up to unintelligible, and see only vertical grain, no joints. I am looking forward to it, but I need to know what caveats to present to the end user and/or buyer. I don't know how that door was made, but why couldn't you use a typical slab door construction with thick enough veneer that you can carve the detail into? Maybe I'm missing something, but it seems straight forward to me. Not being able to see it first hand is the trick, but I think John is on the right track. Probably just a slightly thicker veneer/skin, maybe 3/16"? And carved carefully. I don't think it's a deep carving at all. And I believe from what I'm seeing there are at least 9 vertical pieces/skins/boards edge glued to make up that slab. You can barely make out the joint lines at the color changes. Definitely all vertical grain though.... no rails on the face. I see those type of doors, (all vertical grain w/ rounded top), all the time but don't know exactly how their built. Though I'm guessing Dave knows exactly how they're built and is just stuck on the carved aspect. Please do post back if you undertake this project Dave....would be interesting to see the direction you choose. John, Thick veneers can't be glued solid without tearing up either themselves or the glueline. If it is thick, it should be allowed to expand and contract with the seasons, and hopefully be kept flat. Without seeing any more detail photos, it looks like the stop around it is pretty darn wide. I think the lockset seems mighty close to the edge compared to what I normally see. Do you suppose that would be to accommodate a lot of movement? At what point does a 'veneer' become too thick to stay put? There is a gray area, that probably varies from species to species and type of cut, and runs from 1/8" to 3/4" in thickness. I think I would rule out a solid door of edge glued banks swelling and shrinking with the seasons. Solid could easily move 5/16", and no latch I know of can tolerate that. This Danish door latch is close to the jamb, but I have noticed the European door hardware has a generally narrower backset than what we see in the US, as well as being levers. I honestly don't know how this is built. I am not doing the carving, so will have to see what the carver can tolerate. In the late 80's I made a series of 3 ply doors with a 1/4" ply center and 3/4" or more or less faces. This was an attempt to ignore wood movement and also to prevent "split-thru" on the panels. These seemed to work (underline seemed) as we only got one problem in 20-30 doors that I was aware of. That was South facing, and charcoal almost black on a 26" wide panel. One glue joint about 12" long was trying to open, and another had a bit of a pucker, alone exterior side. Interior was perfect. And no split-thru. That is it. Not definitive, but is it was passable? This door is an interesting architectural feature. By all accounts, it looks to be a solid glued-up slab of something. I can’t determine what the specie of wood is, which would make a huge difference in the success or failure of this door. Much as everyone else, I have no idea how this was done, so it is all speculative. I would think that some kind of internal structural assembly, such as Keith Newton suggests, would be the way to go. I think if this were coupled with a suitable wood, for instance quarter sawn Honduras Mahogany, a slab door like this may not move or warp a tremendous amount, thus not creating a warranty nightmare. The mahogany would be easy for a carver to carve, especially the bas-relief owl that is shown. As David Sochar mentions that the client has a wood carver in mind, then that makes this door more about millwork than art. I disagree with Keith that it lacks sufficient detail, as I think that the purpose of exterior doors like this are to create an effect, and not to incorporate the level of detail that one might expect from an art carving or a showcase duck decoy, or other interior fittings. For my own tastes I think this door, done in Honduras Mahogany, carved and then hit with a very light black wiping stain and rubbed off, would sing. It looks to be a fun overall project. Good luck. So I will go out on a limb here and offer a thought. I am NOT a door maker but have been doing furniture for 20 plus years. So the door appears to be all vertical grain material. What is stopping you from veneering a top and bottom rail in vertical grain material veneer? What if the owl was a glued up wide board/panel, maybe 3/4 thick that was fastened to a "sub" panel set into the groove in the rails and stiles as per a traditional door. Maybe even a vertical scarf joint that would allow the panels to move without seeing a wide crack. If you are familiar with a how a block front door is made on a clock, its along this principle. It would be possible to build a 1 3/4" door out of solid vertical grain honduras mahogany. Its essentially a table top turned vertical. The knob could be a decorative gate latch. They have a very wide range of hook. The deadbolt could work the same way. They often have a good deal of throw. Here is what I think. Open for criticism, please. 1/4" solid, edge glued face, then a cross band of 1/16" similar species, then another layer of 1/4" solid, edge glued. Then a core of ladder construction - mortise and tenon rails and stiles - of 1-1/8" thick, with rigid foam in the voids. Then the same 1/4", cross band and 1/4" on the other side. Epoxy throughout. Why? Balanced. In fact, it is double balanced, to add good karma. I think each face assembly has a good chance of being fine in a relatively stable environment. The core keeps it flat, resists twist, and keeps it all together. The customer describes the site as an 8' deep porch, so it can never get sun or direct rain. I doubt it gets painted black. I am curious to see what the carving will look like when you cut through the top 1/4" layer and hit that glue line and 1/16" cross band. It will show up as a different color ring. My guess is 1/4" is not thick enough for that carving but going thicker causes the issues. I think with quality rift sawn oak you could push the thickness on the face. Well, that is the crux of the problem. How thick can the faces be before there is trouble? When does veneer stop being veneer and become solid wood? I would be willing to push those limits BUT I would look for really high quality old growth material and I would make sure the client understood the potential issues in building that door. One other thought- if that was made in Denmark, does European oak(spessart oak) have less movement compared to American? I would tend to thick it does but I don't know. When I said slab construction I didn't mean edge glued solid wood. My bad. What I meant to say was I would make it from a built up core of plywood and glue 1/4" thick veneer to it. This is really no different than is commonly done making a veneered table top, just that the veneer is thicker. Alternatively, you could make a torsion box with 1/4" plywood skins, and then glue the veneer to that. In either case, you are just gluing another layer of veneer on each side, albeit a much thicker one. I use 3/16" thick veneer for exterior doors. Increasing it to 1/4" doesn't seem like a radical change to me. Take a close look at the bottom left corner and tell me if the door is shy of the stop? Also notice the shadows around the door mat, which indicates the main light source is from the right, so that isn't a shadow in my estimation. I think this would make a good argument for this being solid wood. You KNOW that no glue is going to hold a thick face to any substrate once the MC goes too high. If the glue doesn't fail, it would be because it tore the fiber off the back of that thick face. 1 3/4" to guide the carver. Holding the thing flat would be nothing to worry about with internal support. Also, if you choose QS, make sure it isn't ribbon stripe to help the carver. It needs to be some even texture, medium density, stable wood. I see your thought process. And agree that it all could be solid. But, the Europeans also like their door edges and frames rabbeted, so that could just be the rabbet edge we are looking into. ? I just don't see how I can explain to builder and owner how it needs to be done - latch problems, sealing, etc if it is solid. I don't have solutions for those problems and they could override a crack or pucker. I often see 14" -16" wide Honduras Mahogany solid panels floating in a frame, that have not cracked the exterior paint or interior finish in 15 years. They could have been glued in. We are making solid panels up to 32" w now with cross bands but thin faces - 1/16" face, 1/16" cross band, 5/8" solid, 1/4" stable core, 5/8" solid, then the two 1/16" layers. We have samples of that build out in the drip line of the shop, and they have not moved in over a year. The photos are of a solid cross laminated panel from years ago. Still looks good, despite poor maintenance. The door is 3" x 52" x 112". Last photo is of a building component in - Denmark - that breaks all the rules. Okay - I am looking for real stories of failure in cross grain glued parts, components, doors, tables, etc. No anecdotes unless they are known to be true, or are very funny and at someone's expense. First encounters, please. I need real information. If there are enough solid situations similar to what I propose that turn out disastrous, I will reconsider. If not, I will take the nonexistent Rule Book and and put it in the wood pile for heat this Winter. I am betting ( a lot ) that the above door can be built with 1/2" or 5/8" or 3/4" thick faces on both sides, balanced, with a stable core - a ladder core as is my preference - and nothing else except finish on both sides. No compensation for wood movement. Is there anyone that wants to deter me? Will blood be spilt? Am I letting old age and a past history of drug use take me down some hypothetical dead end? Is the world not as I was taught? Do the Higgsino and wino really mix to make charginos and prevent the wood from doing what is predicted? Cherry coffee table with bread board ends, many years ago. About 30" wide top. I applied glue to too large an area on the bread board end...it split. Just look at antiques...it will split. Here is a radical thought. What if you took your ladder core at 1 1/4" thick or so..make that in two halves 3/4" thick. Take your face stock at 3/4" , glued up as one board/face, and glue a section maybe 6-8" wide and then screw the rest flat with room for expansion. Then glue your two "halves" together. The faces will be allowed to expand and contract. Think it would work? Maybe that door is cracked and its just repaired well. David, aren't your photos just various versions of shop built plywood? I've seen photos of stuff made in Europe in the time of Louis the XIV (late 1600's) showing veneer over cross glued layers of solid wood in pieces that are alive to this day. Those layers appear to be at least 1/4" thick and maybe quite a bit more. I don't know what the thickness limit is, if any, of the layers, but it seems to me that the integrity of the glue bond is the key to longevity and maybe the limiting factor. The photo you show with some 5/8" thick layers as part of the composite supports the idea that the layers can be much thicker than used in conventional plywood. But as long as it's balanced, why would it fail as long as the glue holds? Therefore, your proposed construction of 3/4" "skins" glued to a ladder core would work but only if the glue is strong enough to resist the seasonal movement of those skins. If that's correct, a true plywood construction would offer a lot more glued surface area than a ladder core and would have a greater probability of long term survival - in my mind anyway. I have no experience with a construction of this nature. Pete, I think everyone has made the breadboard mistake. While almost all of my millwork experience is with interiors, I can't help but wonder if the ladder core is the way to go. I agree with John that glue surface area would be more important, and thus a solid core better suited for this purpose than some conventional ladder core. At its core (pun intended) this is no different than mahogany lumber core plywood (I loved that stuff) with thicker crossbanding and face veneer, but having the same balanced construction. My memory of that material was that it stayed flat and did not have radical seasonal changes. This whole thread has been very interesting. David, I can't help but wonder if you have ever talked anyone out of the approach that you seem to want to take. 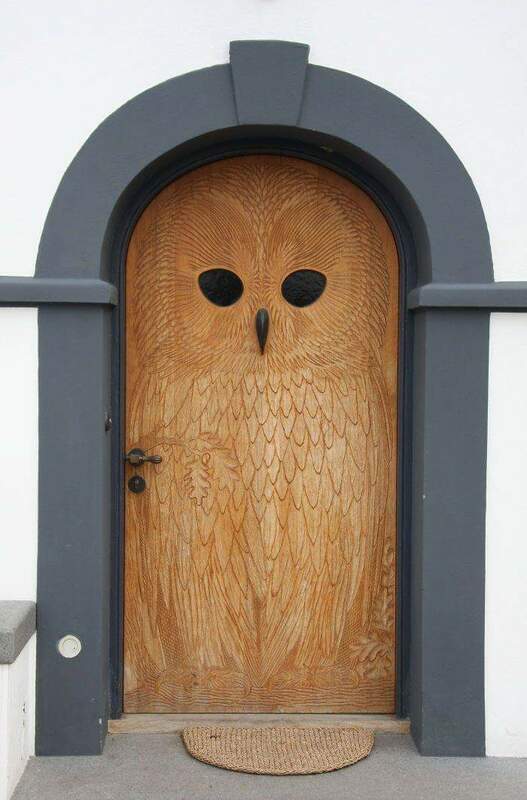 I also wonder if the builder of the owl door had the same level of trepidation that you seem to have. You do not say where this door will be located- state, or area of the country? How about overall width? With the proper wood- Hond. Mah. and very carefully selected quartered grain edge glued, I would not have issue just making it that way. Thickness will help with stability, some level of overhang/ sun/ rain protection wouldn't hurt either. You could then use a thicker stop- maybe 3/4"- 7/8" and possibly do a dual weatherstrip system with the silicone flap type seal like sold thru Conservation Technologies side by side. The latch mechanism could be slightly tricky, but a few hundred dollars to a machine shop, and they could make something work I bet. It looks like 1/4-3/8" of total width shrinkange with about a 6-8% humidity swing. It is widely accepted that thick facings glued to a stable substrate tend to check on the face, the question is how serious will that be given the various parameters- species, cut, environmental exposure, and finish. Since very few builders have tested those limits, you have to look on it as an experiment. If I were bent on reproducing that door I would do one sample as Peter suggests in a very stable quartersawn wood like Honduras mahogany and another with a skin of the same wood laid up on 8mm ocoume marine ply with a ladder core, with the faces only as thick as the carver needs. Put the samples in a wall with interior and exterior exposure and see what happens. Or pick one and do a "full scale mockup" with a sign-off from the client that it is indeed an experiment at his expense. I suspect that the second sample would develop random checking, but that it might be subtle enough to be unremarkable given the carved texture. Worse would be the edge glue joints popping, or the door cupping due to the effect on the thick skins of competing moisture content inside and out. The solid wood construction should fare well re checking, but material selection and conditioning would be key. The same concerns about cupping would apply. I would be reluctant to offer a guarantee on either option. The door I am to build (?) will go from Indiana to Oklahoma. Not sure of the direction in service, but the customer assures me there is an 8' overhang, and the door will probably never get sun or wet. Yes, I am trying to get someone to talk me out of this cross grain construction, or talk sense into me, or most importantly, offer me a sure thing - a method that does not compromise any of the other parameters. But this is woodwork, and I know there are precious few sure things when working with our favorite material. Especially when you are out on the edge. Or the wilderness. I guess I am at the point where I am going to demand, in a large voice, that the BOOK be rewritten based upon this one revised foundational change. Cross grained wood may not self destruct in every situation. The earth has cracked, the hounds unleashed. Some years ago, I heard there were Two Truths to Woodworking: One - Wood moves. Two - All woodworkers will disagree as to how much, when and where and why this happens. Thanks for the good conversation, gentlemen. I'll raise a glass to you this eve. I've been following this thread since the beginning. I believe you are on the right track with your cross grain construction. I'm sure you've thought out on how thick your skin needs to be, but if the cross band under the face is the same species and maybe the same thickness, I don't think it will show if the carver cuts into it. For some reason this project of yours has been sticking in my head. I'm working on some god awful boring projects now so that may be it. I have offered some ideas that I'm not sure I would attempt. If you take the lumber core ply example. And by the way, I loved that stuff as well... 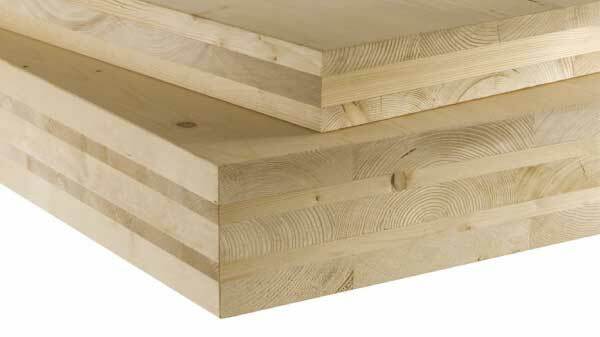 If you took the approach of using solid lumber, maybe 1/4-3/8" thick and basically made your own version of lumber core with cross plys, and used epoxy, you are essentially encapsulating your core in a moisture proof package. Assuming moisture can not penetrate epoxy right? Then zero movement? If you face glue your skins front and back at 3/4", guessing that is enough, on a rift sawn oak or quartered material, I would think it would work. Worst case scenario it does crack and even in all that carving, the repair might not be bad. If it is going from Indiana to Oklahoma, build it in winter when things are bone dry. Then you know it may swell. I have to politely disagree and carving into the cross band, it will be seen. You may be 3/4 thick in the center and taper to 1/8 by the time you get out to the ends or sides of the door which will minimize cracks. Please keep us posted as to what you do and how it works. There was recently an article about a company manufacturing cross laminated structural panels. Don't know ply thickness but at least 3/4". Solid lumber! I made a comment about it on the woodweb. Oklahoma has huge swings in seasonal humidity. CHICAGO - Claiming it will be the largest mass timber structure in the United States, real estate developer Hines will build a six-story, 270,000-square-foot office building on Chicago's North Side. This is lumber, glued 90 degrees, into slabs. Yes. This is exactly what I mean when I mention it above. Is the BOOK to be rewritten? Has the world changed so much that this now does not violate one of there fundamentals of working and designing with wood? My fear is that these are just 22 yr old engineers having these great wooden slabs made up, and they are completely clueless to that little engineering note about wood being hygroscopic and changing dimension as a result. Whoops! Or, are the people behind these slabs knowledgeable and have some direct experience that they will work, will work well, and will not self destruct in some manner? In my much younger days, I did some testing to see if the cross lamination was just BS or really needed to be taken into account when designing. I glued up solid wood in a variety of thicknesses and angles. Most, but not all, of the test parts that were near 90 degrees and over 3" wide failed in one way or another. This was a full season test in Nebraska weather. Not much different than Chicago! The slab guys have built a plant in the Pacific NW to produce the slabs. Big investment but cheap considering what it will cost if the Chicago project fails. I recall that of several solutions offered by Tage Frid re solid-door construction about 30 years ago, the only one aimed at eliminating movement was to use 1/2-inch or larger threaded rod and countersunk lock nuts w/washers. He recommended using splines to ensure air-tightness and sequentially drilling and clamping the individual boards so that initially drilled holes would guide subsequent drilling. There could be a bit of lateral movement of the individual pieces, but width would be constrained. Depending on one's capabilities, all of that drilling could be an act of faith. I'd likely make a practice door first out of white pine or alder! Bill, What happens when the wood expands and causes the threaded rod to compress into the wood causing compression set, then the wood shrinks and the rod is then not touching the nuts & washers? At that point the rod is doing nothing!